Mix the sugar, cornstarch, and salt in a sauce pan. Gradually stir in the milk. Add in the chocolate chips and unsweetened chocolate. Place the saucepan over medium heat, stirring continuously, until mixture thickens and boils. Boil and continue to stir for 1 minute. Add egg yolks to a medium ceramic or glass bowl. Gradually add half of the chocolate mixture into the egg yolks, whisking constantly. Pour mixture into the baked pie shell. Press layer of plastic wrap onto filling. Refrigerate at least 4 hours but no longer than 48. 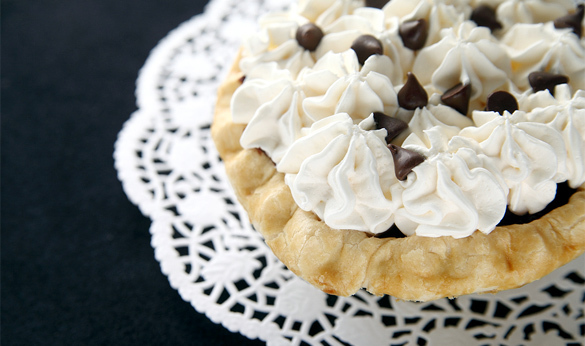 Remove the plastic wrap before serving and top with whipped cream and chocolate shavings or coco powder.